I explained that, yes, child abuse IS a big problem, but that it's not our specific focus. I then thought to myself, "Why is it that Childhood Domestic Violence is often confused with physical child abuse?" I was talking with a woman I met on a flight the other day and my work in the space of Childhood Domestic Violence (CDV) came up. She told me "That's a great cause. Child abuse is a big problem, and those children need more people to help them." Every April during National Child Abuse Prevention Month, many concerned organizations and individuals unite to bring awareness and rally for an end to child abuse -- an issue that affects more than 1 million children in the United States every year. But a crucial connection to another adversity that one often faces in childhood remains overlooked, helping perpetuate both issues into the next generation. It has very little awareness although 15mm children & 40mm adults experience it. Childhood Domestic Violence (CDV) is often confused with child abuse because it has very little awareness, although it impacts 15 million children and 40 million adults in the U.S. CDV is when a person grows up living in a home with domestic violence. From the standpoint of a person in childhood, domestic violence is violence between parents or violence towards a parent -- perhaps from a stepparent or significant other. There is a definitive understanding that child abuse can often lead to problems in adulthood with relationships, emotions, behaviors, and health. But what is little known is that CDV has a strikingly similar impact. UNICEF calls CDV "the single best predictor of becoming a victim or perpetrator of domestic violence" later in life. 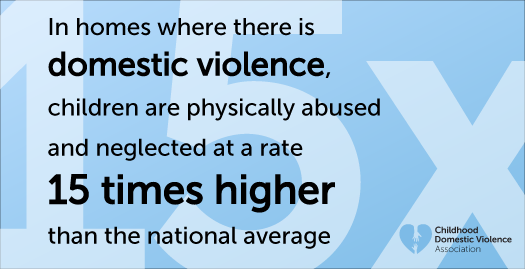 And this is key in addressing child abuse, because in homes where there is domestic violence, children are physically abused and neglected at a rate 15 times higher than the national average. The statistics are clear -- a child is much more likely to experience child abuse or neglect if at least one of their parents experienced CDV in their childhood home. Evidence also shows that when a child experiences both CDV and child abuse together in their childhood home, they tend to fare worse later in life than if they had experienced only one of these adversities in isolation. CDV and physical child abuse have a "similar impact"
"Most people know of or can imagine the extreme negative effects of child abuse," said Dr. Linda Olson, licensed psychologist and psychotherapist. "But what many fail to grasp is the similar impact of Childhood Domestic Violence on a person, as well as its strong relation to child abuse. And those are key pieces of the puzzle in addressing both issues." First, by building greater awareness of CDV, we can make significant strides in not only curbing CDV but also child abuse. Second, we can step in and become THE ONE for someone who was or is impacted -- especially a young person who may currently be experiencing CDV in their childhood home. A caring adult stepping in to help a child become aware, understand, and share is a critical factor that fosters resiliency. You need not be a child expert to make a difference. By taking some small actions and sharing some simple messages, you can begin to positively transform a life. You can learn more by taking the evidence-based, free online training, CHANGE A LIFE -- the only training of its kind in the world. For impacted adults, awareness and education are equally central to helping them connect the dots between what they experienced in childhood and the challenges they face today. Knowing it is a thing and what to call it -- Childhood Domestic Violence or CDV -- is an essential first step. Knowing there are resources available to help is the next step. Only then can they begin to unlearn the negative beliefs learned in childhood and shift the paradigm of their lives.